The men’s podium (L-R): Lelisa Desisa (2nd), Lemi Berhanu (1st), Deribe Robi (3rd). The 2015 Standard Chartered Dubai Marathon gave United States citizens terrific Thursday night racing, as the 26.2-miler began at 10 p.m. ET (7 a.m. local time on Friday). More than 25,000 runners participated, and 21 men with a 2:10 marathon PR or faster toed the line. If you’re not too familiar with this United Arab Emirates marathon, the winners take home $200,000, and East Africans are aplenty. The 2015 edition delivered, and I’ve put together 5 Hoorays from my viewing of the Dubai dandy. Note: This is Hooray Run’s first-ever 5 Hoorays. Enjoy. I wholeheartedly support House of Run’s use of the word “flawless” to describe the online stream. I’ve watched numerous races and meets via live stream, and I give a standing ovation to EverSport for its excellent production of the Dubai Marathon. No lags, awe-inspiring shots, a crisp picture the entire way through. This live stream had it all. EverSport, please do more big races in the future. Holy cow. The above is just a glimpse of what the cameras caught of the heavenly Dubai skyline on Friday morning in the UAE. The shots were soothing, and they added even more life to the broadcast. Speaking of adding life to the broadcast… Just after the 1:30 (one hour, 30 minutes) mark of the marathon, the legendary Ethiopian distance runner Haile Gebrselassie joined in on the call. Gebrselassie is a two-time Olympic 10K champion, and in 2008, he broke his own world record in the marathon with a time of 2:03:59. Haile—a three-time winner at Dubai—offered marathon strategy and expansive running knowledge for nearly an hour. Gebrselassie’s use of the word “exactly” was redundant, but I loved it. He was enthusiastic and passionate about the races at hand, and he couldn’t contain his exuberance for the Ethiopian dominance. The 41-year-old brought it. 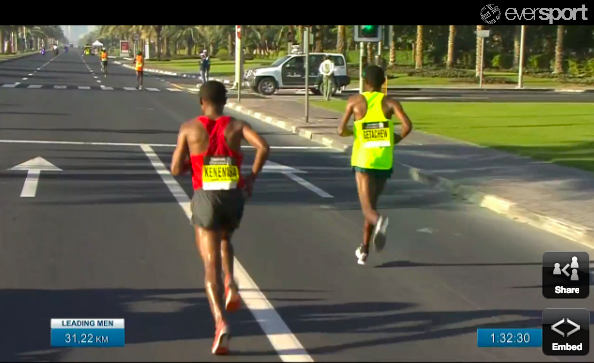 This is a screenshot of Ethiopia’s Kenenisa Bekele well off the lead pack just past the 31-kilometer mark. Bekele reportedly dropped out at 36K. Now, why is Bekele—a DNF—No. 2 on this list? Because of what he’s done for running. Bekele’s inability to finish the race has made headlines, but can we talk about what this man has accomplished? For starters, he owns world records in the 5K (12:37.35) and 10K (26:17.53)—two marks I feel will not be threatened anytime soon. He also ran a 2:05:04 marathon debut at the 2014 Paris Marathon, shattering the course record. The 32-year-old has years ahead in road racing. Don’t let this Dubai DNF distract from what he’s done and what he will do. Aselefech Mergia won in 2:20:02, just one second ahead of Gladys Cherono of Kenya. How about the Ethiopian dominance? On the men’s side, a relatively unknown Lemi Berhanu captured the $200,000 prize with a time of 2:05:28. On the women’s side, Aselefech Mergia recorded her third Dubai victory. She ran 2:20:02 to defeat Kenya’s Gladys Cherono by one second. What made Friday even better for Mergia? Yeah, maybe $200,000. But really, it was her 30th birthday. What a day! For more Hooray Run write-ups, click here.